Montana Stainless Action. Stainless Barrel. 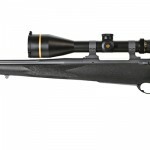 Leupold VX7 4-18 Scope. Titanium Rings. Black Composite Stock.